The moments lived between life and death. The thoughts, feelings, reality of that slide from on the verge of starting new, to saying good-by. Debra Samson’s Between takes you into the time between being diagnosed with terminal cancer to the very the last breath. As a person who regularly works with those in hospice and their families, and leads funerals, I wasn’t sure if taking a book about death on vacation with me was a good idea. Yet, the book isn’t about death. It is about life. It is about friendships and living in the moment. It is about making decisions and living with the fall-out. It is about realizing who we truly are, not who others want us to be. It is about exposing our true selves, and celebrating it! Inspired by the lives of real people, Debra’s words made me feel as if I was reading a blog written by the actual woman. Between is real life, lived. 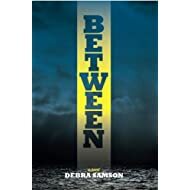 Here is a link to Between on Amazon, and Debra Samson’s Between website. Creator God, thank you for reminders that we are so blessed that we have the opportunity to live. Amen. This entry was posted in Book Review, Spirituality - Spiritual Journey, Writing and tagged Between the novel, blessings, community, Debra Samson, Hope, hospice, patience, tears. Bookmark the permalink.